Since the 1-2 wave of figures is so large, I’m breaking my review up into smaller bite-sized articles so that you can get the content quicker. I will include my final overall thoughts on the 1-2 wave with the final mini-review. Background – This figure pack is definitely the most common of the 1-2 wave and at the time of writing, it is the cheapest to buy as well. In many ways, this makes sense because it is a very utilitarian figure set. Anyone can find something to like and use in their levels here. Fire Luigi – While we already have Luigi in several different forms, a Fire Luigi is certainly a useful addition. Luigi looks great in his green and white outfit and my figure has very few imperfections. There are some figures that have paint problems around his mustache but outside of that, Luigi is a pretty solid figure. Fire Luigi is an outfit/Power-Up that goes with any level too so this a figure anyone can find a use for. 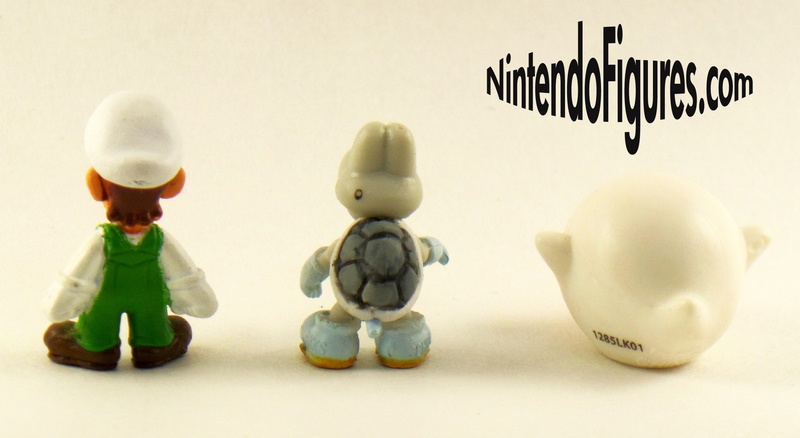 Dry Bones – Much like the Koopa Troopa, I find this figure to be cute in such a small size. The pose fits Dry Bones perfectly and the detail in his eyes, nose, and shell are all excellent. Dry Bones would work in Layer Cake Desert well and would be perfect in a Bowser’s Castle stage so he is fairly flexible and a figure I think most collectors will want since he is almost iconic in Mario. Boo – The only thing more iconic is Boo, which not only has excellent eyes and a solid paint job, but is the kind of enemy that any Mario fan must own. The only downside is that we once again have the item number on the back of an otherwise great figure and we don’t really have any tiles that Boo matches up with yet. A ghost house would be perfect for Boo and another thing I’d sorely like to see within Micro Land. ClosingThoughts – Just because these figures are very common, does not take away their value to collectors. If you like or want to own common Mario enemies then this set is an easy recommendation. While every figure varies, the paint job I’ve seen on these is mostly decent and some are even great. I wish we had tiles/playsets that are a perfect fit for these figures but for now, these figures are a nice addition to any level you create. Previous World of Nintendo Micro Land Zelda: Wind Waker Figure Packs Revealed!